Barcelona en Comú continues to make waves and has transformed the water, energy and public housing sectors in Spain’s second largest city. On one of the first hot days of 2018 in Barcelona, Silvia is staging a sit-in outside a public railroad office by the beach. Her green shirt marks her fealty to the Platform for People Affected by Mortgages (PAH), perhaps Spain’s most prominent grassroots organisation in the field. The protest gathers some 30 people from all walks of life, almost all wearing the same shirt or hoodie, one holding a bullhorn, another blowing a whistle. Silvia helps hang up a banner on the wall. There is chanting and dancing, all in support of one individual who is about to lose his home. Just a year earlier, Silvia had faced her own eviction, narrowly avoiding life on the street with her three children. Now, she lives in public housing provided for by the City Council and the governing citizen platform Barcelona en Comú, or ‘Barcelona in Common’ (BComú). With evictions high, public housing low, and water and energy services unaffordable, BComú is a key player in the push for an accessible, dignified living situation in the city – but they’re not alone. BComú is a key player in the push for an accessible, dignified living situation in the city – but they’re not alone. Barcelona’s efforts to bring water, energy, and housing to the people are best illustrated by this interconnectedness. A front – sometimes united, sometimes less so, but a front nonetheless – between citizens, movements, and institutions. Silvia still loyally supports the PAH, participating in weekly events. “Once I joined up, I never left,” she says. They helped her with a difficult situation: at first, without an official eviction notice, she didn’t qualify for help at the Emergency Desk, the high-risk housing entity created by BComú. Through efforts including a sit-in lasting over two weeks, it was with the PAH’s help that Silvia finally got her home. The PAH’s strength comes from the loyalty of members like Silvia. In turn, BComú and the City Council need support, pressure and also criticism from social movements. Silvia and another member of the PAH hold up a banner at the sit-in to help another member avoid an eviction. Credit: Rae Bathgate. Silvia’s housing situation isn’t rare and hasn’t been for some time. During 2017, 2,591 evictions took place in Barcelona according to the General Council of the Judiciary (GCJ). In Catalonia, the numbers have gone down 5% since 2016, and 16.8% since 2013, but the problem remains. Since 2013, Barcelona has seen more than 14,841, with Catalonia surpassing 74,548. In the second-largest city in Spain, 36 families find themselves without a home every day. This puts Catalonia at the top of the list for most evictions in all of Spain. In Barcelona, available public housing is at a dismal 1.5% of the total, a situation that Irene Escorihuela, director of ODESC (a platform focused on economic, social, and cultural human rights) describes as “terrible […] evidently, very difficult.” It’s due to there being such little housing available that “the relocation part is the hardest,” she adds. ODESC occasionally works with other grassroots movements, such as Alliance Against Energy Poverty (APE), Water is Life, and The Network for Energy Sovereignty (XSE). These focus on another issue: the lack of access to modern energy services due to power cuts following financial difficulties. In the last 12 years, the price of electricity (and with it, light) has increased by 83% in Spain, and coupled with the economic crisis, has led to drastic problems, even mortalities, when people without power resort to gas or candlelight. The Association of Environmental Sciences (ACA) reports that as of 2014, 52.1% of families in the metropolitan area of Barcelona had difficulties paying their energy bill. 10.6% of that figure stopped heating their homes, according to a survey by Fundació ABD. The right to water has also been included in the rallying cry for a dignified life. In the city, it’s around 80% owned by Barcelona Water (AGBAR), apparently acquired in a disputed transaction made without a contract. According to data from APE, from 2008 to 2016, AGBAR shut off water to some 75,000 families in the Barcelona metropolitan area, due to payments not being met. Silvia sits in her home, filled with furniture bought secondhand, given to her, and found. Photo courtesy of Rae Bathgate. Barcelona’s fight for municipalisation is often traced back to the Spanish anti-austerity ‘indignados’ movement, known as ‘15M,’ referring to the day when millions began occupying city squares – May 15, 2011. This brought attention to various grassroots organizations, including the PAH. 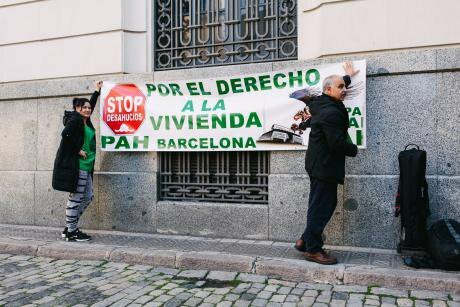 Years before Silvia was protesting evictions, another woman made headlines doing the same: Ada Colau, one of the PAH’s founders and its spokesperson. Photos from 2013 show Ada Colau being dragged out of demonstrations by the police. Then, two years later, she’s pictured celebrating her election as the first woman mayor of the city through Barcelona en Comú. Describing itself as a ‘convergence’, her campaign platform began as ‘Guanyem Barcelona’ (‘Let’s win back Barcelona’) in 2014, with a manifesto signed by some 30,000 citizens. Founded on the principles of water, energy, housing for all, it campaigned solely with grassroots funding. Colau was elected in June 2015, and now BComú governs the City Council in a minority, with 11 out of 41 councillors. Colau wasn’t the only ‘mayor of change’ to have won against established parties. What’s known as ‘la nueva política,’ (‘the new politics,’) has been espoused by eight major Spanish cities. But Escorihuela from ODESC believes that despite being in the minority, BComú has been able to achieve the most. BComú has been in their new offices for a few months, now. The ground floor is bare, but the upstairs area is bright and buzzing with people. The walls are covered with flyers, often with a familiar face: Colau on a campaign poster in Korean; Colau as a cartoon on an employee’s coffee mug. 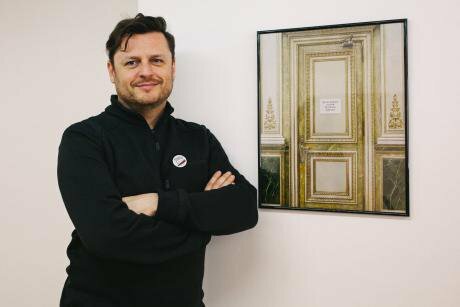 One photo shows a printed sign reading ‘don’t forget where you’re from’ on a gilded City Hall door, famously hung up by BComú officials on assuming their new job. Enric Bàrcena poses at Bcomú headquarters in front of picture of sign famously hung up at the City Hall reading, in Catalan, ' May we never forget who we are nor why we are here.' Photo courtesy of Rae Bathgate. Since making it to the City Council, BComú is proud to say that, for the first time in 10 years, water prices have dropped. 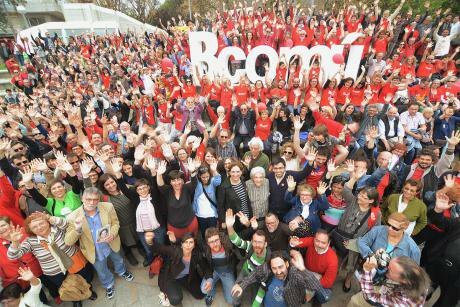 BComú set in motion a ‘multiconsultation’ – a sort of citizen petition and referendum – to vote on remunicipalising water. It’s also opened a municipal energy company, Barcelona Energia, to be available to citizens in 2019, as the biggest 100% public company in the Spanish state. But the platform is best known for its fight in the housing sector. Since 2015, there has been a drop in evictions. According to GCJ data, evictions due to mortgage problems have gone down around 14% since 2016, after growing year after year up until 2015. Now, there’s a new problem and it is not so clear cut: evictions due to unpaid rent. 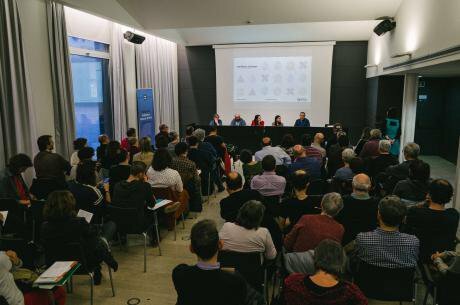 Out of the more than two and a half thousand evictions in the last year in the Catalan capital, 85% were due to unpaid rent. This is known as ‘invisible evictions’ – where renters often leave before it ever makes it to the court. If a change is to last [...] “each little advance has to be forever." This is in part due to the ‘sharing economy’ housing crisis seen worldwide: giant platforms like Airbnb are used by agencies and funds which buy large amounts of property to later rent out to tourists at exorbitant rates. This, in turn, increases housing prices neighbourhood by neighbourhood, making them unaffordable for locals. Barcelona, a popular tourist destination, was hit especially hard by this trend. As a solution, BComú implemented a Special Tourist Accommodation Plan (PEUAT) and increased both the fines for illegal tourist housing as well as the number of inspectors to find them. For those who live in Barcelona and are struggling to pay their rent or mortgage, Colau’s platform has helped. She increased the public housing budget by four times and created the Emergency Desk to relocate those in need of the most urgent help following an official eviction. During the eviction itself, two groups UCER and SIPHO, teams specialised in negotiation and social services respectively, were put in place to intervene. The Housing Rights Plan, approved in 2017, foresees building more social housing. “But more is needed,” expresses Escorihuela from ODESC. The director questions how many of the platform’s initiatives are permanent, and how many are symbolic. Elections are coming up soon, and she thinks BComú should take advantage of the time they have in office to make changes, some that a potential subsequent right-wing government would not be able to reverse so easily. Meanwhile, Bàrcena from BComú explains that one of their enemies is “impatience.” He adds that it’s important to “recognise the limits” the platform has, and that change within City Hall moves slowly, especially when it comes to permanent measures. If a change is to last, he insists, “each little advance has to be forever." The second ever debate ‘From the Neighbourhood to Europe,’ focused on water and energy solutions for Barcelona and beyond. Photo courtesy of Rae Bathgate. Much of the attention on BComú has focused on its origins in activism; but the story doesn’t end there. It’s impossible to speak of BComú’s contributions to the city without acknowledging the relationship it now holds with social movements, one that’s not always friendly. Barcelona is in a unique situation. In the midst of a tense debate on self-determination and Catalan independence, it is still reeling from the financial crisis and reckoning with the ghosts of a past dictatorship. It embodies a powerful history in activism and local life, where focus is placed on policies for individual neighbourhoods and their different needs. But this does not exclude the larger aim of facing outwards. BComú has published its ‘How to Set up a Municipalist Platform’ in several languages and has started a yearly International Municipalist Summit called Fearless Cities. They also hold monthly debates called ‘From the Neighbourhood to Europe’ in Spanish, which are live streamed, so far concentrating on housing, water, and energy. By nurturing local neighbourhoods, reaching out to create a worldwide community, and encouraging connection between institutions and grassroots movements – even if in the form of criticism – a ‘marea’ is the goal.